Styling advice from Harris and Zei founder Nahid on adding creative flair to your classic suits and outfits. Adding a flash of colour is a key way to inject some personality into your suit. Think more Usher than Noel Fielding; less is often more. Start with solid-coloured socks, for example pairing steel blue or scarlet socks with your mid-grey two-piece. Ties are also a great opportunity to get creative; florals are a key trend for Spring/Summer 15 or experiment with traditional spots or stripes. Explore contrasting patterns to elevate your favourite suit, from a classic Liberty print to a modern geometric design. Go all-out with a patterned shirt, or add a subtle twist with a pocket square; whatever feels most comfortable for you. If you find a fabric you particularly love, we can create a bespoke shirt with your choice of material and details; a unique way to stand out from the crowd. An eye-catching watch strap can add personality to your outfit, such as the classic Swiss Mondaine, or dress up your shirt with some eye-catching cufflinks; Mr Porter has a great selection. I particularly like Paul Smith’s quirky designs and they’re just subtle enough to work in the boardroom as well as the bar; even the toy rockets. Spectacles and sunglasses are also an easy way to stand out; add a playful twist with modern frames or vintage-inspired aviators. Pairing your suit and shoes requires some precision, but a smart pair of brogues is often a solid option. These wing-tips from Grenson will last a lifetime and help you look seriously sharp in the process. Or slip on a pair of Burberry Prorsums for your commute and get some real attention. So there you have it; Nahid’s short but sweet run-down of the key ways to style your classic suit. 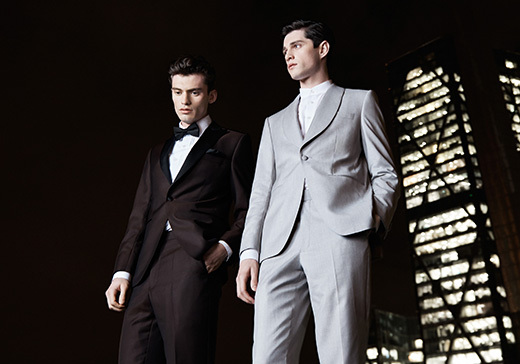 Do you have any go-to brands or accessories for elevating your classic suits and office outfits? Share your tips on Twitter @HarrisAndZei or in the comments box below.